Cloudy skies. A stray shower or thunderstorm is possible. High 78F. Winds ENE at 5 to 10 mph.. Scattered thunderstorms this evening giving way to periods of light rain late. Low 59F. Winds light and variable. Chance of rain 70%. What I need to write instead of a review is simply a public service announcement alerting you to the fact that Billy Collins has a new collection of poetry, so here it goes: “Billy Collins has a new collection of poetry titled ‘The Rain in Portugal,’ which was released Oct. 4 and is now available in bookstores near you. Well, if you still have bookstores near you, it should be available, and if it’s not, you should storm up to the counter and ask them how they can call themselves a bookstore. Throw one of those “Diary of A Wimpy Kid” books that they always have near the checkout counter angrily to the floor to underscore your disgust. End of public service announcement. My work here is done. 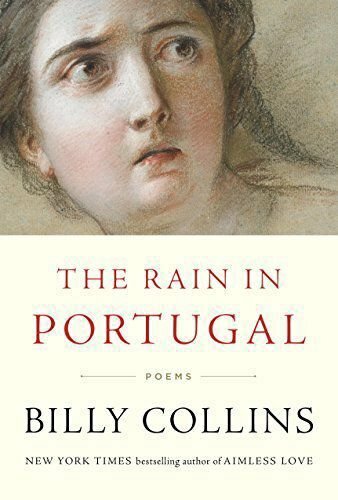 Now, for those of you who may not be poetry fans and couldn’t care less that Billy Collins has a collection of 56 new poems (that’s less than 50-cents a poem for you on a literary budget), I would offer that you have never read Billy Collins or else you could not care more that “The Rain in Portugal” is now available. Collins, as per his usual, has a poem for everyone. If you’re a cat person, “Early Morning” is the poem for you (and my personal favorite in the collection). If you’re a dog person, “In Praise of Ignorance” is for you. If you think about death, or you’ve seen the sun rise, or think that J. Alfred Prufrock could have changed it up a bit and not worn pajamas in the daytime, there is a poem for you. Billy Collins is truly a poet of the people, unless you’re a superhero or a zombie—I don’t think he has one in there for you, but you can buy those next to the checkout counter when you go to the bookstore. is a freelance reviewer in Spotsylvania County.